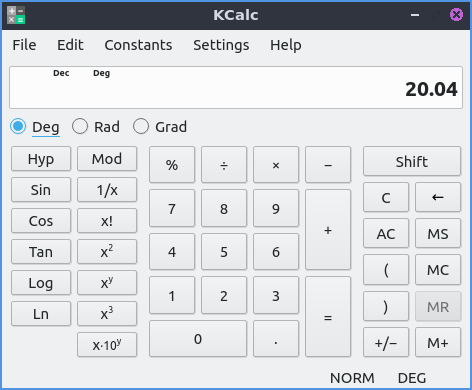 Kcalc is a scientific calculator application. built in mathematical and scientific constants. To do simple arithmetic click the numbers and then press the sign for addition, multiplication, subtraction, or division. You can also type in the numbers and press + for addition, - for subtraction, x for multiplication and / for division. To view the answer press the button that is an =. To view a summary of each button you can mouse over to get a verbal description of the button. To make a number negative press the button that looks like a +/-. To insert decimals press the decimal point button which looks like a . when you get to the part which is less than a whole number. To clear input from Kcalc Press the button with a C on it. To group operations so they happen together use the parenthesis to make things grouped together for example 2*(2+3) would give the result of 10 because it would add 2 and 3 and then multiply by two. To copy and answer out of Kcalc press control + c or Edit ‣ Copy from the menu. To paste a number into Kcalc you can press control + v or Edit ‣ Paste from the menu. To cut the text from Kcalc press control +x or Edit ‣ Cut from the menu. If you want even more functionality of Kcalc there is also scientific mode which is accessed from Settings ‣ Scientific Mode radio button. The button 1/x takes takes 1 and divides it by the number currently on the calculator also known as taking the reciprocal. x! read x factorial will take the number X you entered and multiple each number going down to 1 for example 5! would multiply 5*4*3*2*1. The x 2 button will take a x*x and multiply it by itself or square x. The button with x y will take x the number you have in will exponeniate x to the power of y. The x 10 y will end up multiplying x by 10 to the power of y so for example to multiply 5 by 10 to the power of 3 entering in will give the answer of 5,000. If you want your own custom constant buttons check the checkbox for Settings ‣ Constants Buttons. To change the unit that angles are measured in for triginometric units in Kcalc. Degrees take 360 to form a full circle while, 2Π radians form a full circle and 400 gradians form a full circle. The radio button for Deg is to select Degrees as the unit for angles, Rad selects radian as the unit of measurment of angles and Grad selects Gradians as the unit of measurement for angles. The Sin button takes what you have as the input and takes the trigonometric sine function of that value measured in the unit for angles you have selected. The cos button takes the cosine of the vlaue in the unit of angle you have selected. The tan button takes the tangent of the angle in the current units. To have a log with the base of 10 type the number you want to take the log of then press the Log button. To take a log based off e type the number you want to take the logarythm of then press the Ln button. The Scientific mode also brings in a menu for many different predetermined comments under the Constants. To store a value in memory press the M+ Button. To retirve a value from memory press the MR button. To clear a value from memory press the MC button. The numerical system mode lets you change your numerical base instead of say the default base 10. To switch to a binary calculations click the Bin radio button. To switch the Octal or base 8 format click the Oct radio button. To switch to a hexadecimal format or base 16 format click the Hexadecimal radio button. For numbers greater than 10 for hexadecimal press the A-F buttons. When you are in number that are not part of a numerical base the button will get grayed out. To switch back to decimal or base 10 press the Dec radio button. To enter Statistic mode Settings ‣ Statistic Mode. To enter multiple entries of data press the Dat button to enter data. To show how many pieces of data you have entered press the N. To view the mean or average of all the data press the Mea button. To view the median of the data press the Med button. To clear the statistical memory press the CSt button. To open configuration for kcalc press Control+Shift+ + or Settings ‣ Configure Kcalc. To change the maximum number of digits change the Maximum number of digits field. To have kcalc set decimal precision to only a certain number of places after the decimal place check the Set decimal precision checkbox and select the number of digits after the decimal place. If you ant to show the result in the window title check the Show result in window title checkbox. To have Kcalc group digits together check the Group digits checkbox. To cancel and not apply your changes press the Cancel button along the bottom. To apply your changes and not exit from this window press the Apply button. To restore the settings to your defaults press the Restore Defaults. To apply your changes if any and close this window press the OK button. The Colors tab has the colors of your user interface. To change your foreground color will change how the display or the number in the interface is the color next to Foreground color area to select. To change the background color of your display choose a different color on background button. To change the background color of the function buttons press the button next to Functions. To a change the color of the function button press button next to Statisical functions. To change the background color for hexidecimal functions Hexadecimals. To change the backgrounds of the numbers buttons press the button next to Numbers. To change the background of the memory keys press the button next to memory. To change the background of operations press the button next to Operations. To change your settings for constants of to get constants constants stored is in the constants tab. To input a constant you have in the field to the left is the name of the constant on the field to the left. The filed in the center is where you put the value of the constant. To select from predefined constants press on the Predefined to bring up a menu of predefined constants. 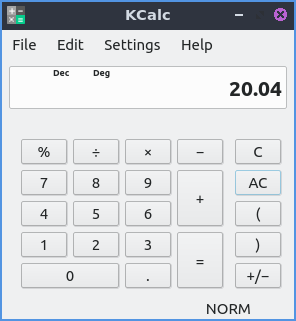 Lubuntu ships with version 18.12.3 of Kcalc. from the command line. The icon for kcalc looks like a box with a + sign a - sign a multiplication sign and an equals sign.